The manual comes in handy! Looks like it could be a number of things. Thankfully most of them look to be pretty simple. Of these, only a few would allow the bike to operate normally still (redundant TPS sensor, O2 sensor, secondary air sensor). 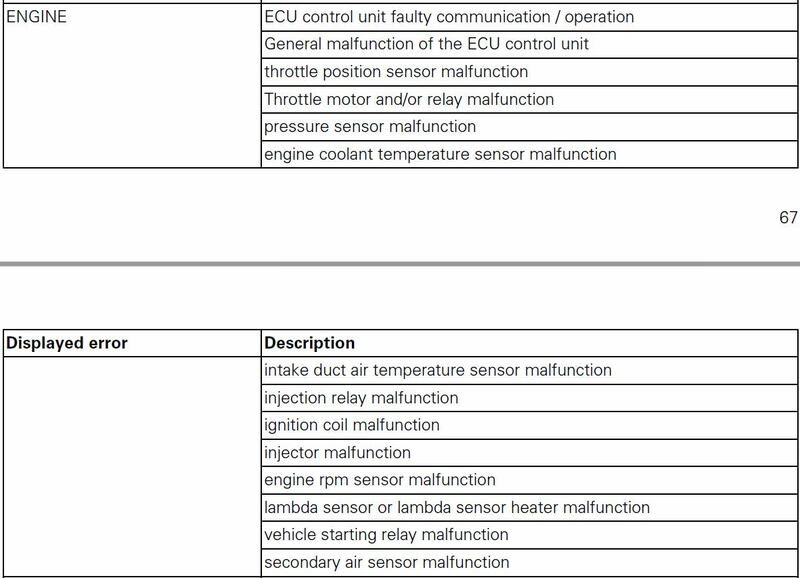 Throttle sensor perhaps. That's the only thing I got error codes for. Recalled then replaced and did it one more time, cleared them and has been flawless for three years. I believe it could be the bike learning the new input controller (the rider) and vice versa. Maybe once he sensitizes to it it will accept him. Maybe not. Maybe he'll demand his money back and it really will be your curse, to have the best Hyper ever. Funny enough this happened to me in the middle of the Utah dessert. I'd been making great time along route 95 maintaining a steady 95mph (no traffic, clear views, awesome) when the bike hesitated and went into limp mode. I pulled over and the throttle was stuck around 3500 and there was a giant exclamation point on the dash and a CEL. I shut it off, began contemplating just how much of an adventure it would be to get towed out of there and fired it back up. I started and idled fine so off I went. The CEL actually went away by the end of the day but I figured that since the bike was running fine it was a sensor and not actually anything wrong with the motor. Given the heat (it was 100+ in Utah) I suspect one of the O2 sensors gave a bad reading. It'll go into the dealer when I get back (with another 1400 miles on the clock by then) to get the brake fixed and the error code checked. Hopefully it's still in memory by then. That's funny. I would freak out for a moment too... glad to hear you're on your way and the trip is going smoothly. What about doing the simple things first? I would suggest he disconnect the battery, wait 5 minutes, re-connect. See what happens. buttons at random and created some sort of problem. Just a guess. You, of course are under no obligation to cover that cost but chipping in a bit might be nice. Hope it gets solved! He tried disconnecting the battery. The light went off but came back on after about 5 minutes of riding he says. He says he just filled up with gas, stalled the engine, and that's when it happened - who really knows? I suggested unplugging and replugging several connectors, namely the TPS and O2 sensors. Yes, a dealer could easily plug in to see what it is. It might come down to that if it doesn't resolve itself. Thankfully - he said he's been riding it around without any issues and loves it. So there's that! He's also very mellow and is confident he will find a solution soon. Last edited by kuksul08; July 6th, 2018 at 06:48 PM. Or the easiest way to fix the problem is to stop answering his calls or texts. His bike now, right?